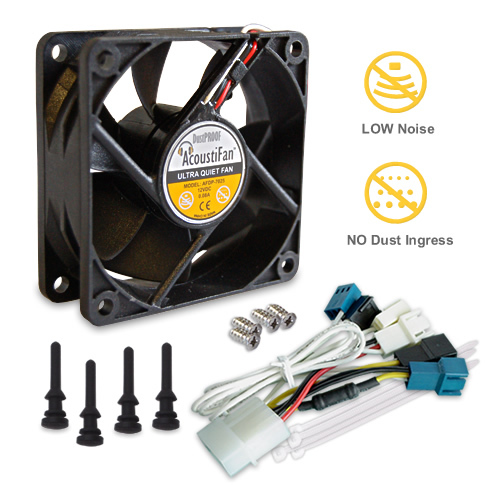 A NEW range of premium quality, ultra-quiet dust-tolerant multi-application cooling fans for PCs. These fans have been designed to be quiet and stay quiet! They also come with a 3-speed fan cable accessory providing a choice of 3 speeds & 4-pin connectivity. No harmful dust ingress means that dust stays out of the motor, bearings and fan circuitry to help keep the fan quiet, cool and prolong it's lifetime. Also included are 4 FREE Ultra Soft Anti-Vibration Fan Mounts. We are committed to publishing accurate and truthful noise level data - taken directly from acoustic testing reports to recognized International Test Standards. At 1m distance in the average home/office environment noise levels below 10dBA will be difficult to discern above normal background noise levels. Fan Start at 5V DC? are taken at 0.3m distance and extrapolated to 1m, so that recorded levels are significantly above test chamber background noise levels. ** The quoted RPM for an individual fan may vary slightly by as much as 10% (figures shown are averages from multiple tests). A variation in RPM at a given voltage will result in a change in airflow and noise levels. of a constraint that has prevented the blades from spinning.